The Terrier Hockey Fan Blog: Merrimack rallies past BU in third, 3-2. For the third time this season, the Terriers took a lead into the third period, but couldn’t bring home a win, falling to Merrimack, 3-2 in North Andover. After yield a goal to the Warriors just 2:34 into the game, BU knotted the score late in the period at one on Matt Grzelcyk’s second of the season, assisted by Danny O’Regan and Nick Roberto. Midway through the second period, BU took the lead when Tommy Kelley (photo) scored on the backhand, converting a Robbie Baillargeon feed. Matt Ronan, who initiated the goal by separating a Warrior from the puck, also added an assist. But early in the third period, Merrimack tied the score at 2-2 on Brian Christie’s power play goal. Six minutes later, the Warriors’ top scorer, Mike Collins weaved through the Terriers to score the game-winner. BU took two penalties in the third period to none for Merrimack, which outshot the Terriers 13-3 in the final period. Matt O’Connor turned aside 27 Warrior shots. Merrimack’s Rasmus Tirronen made 17 saves. 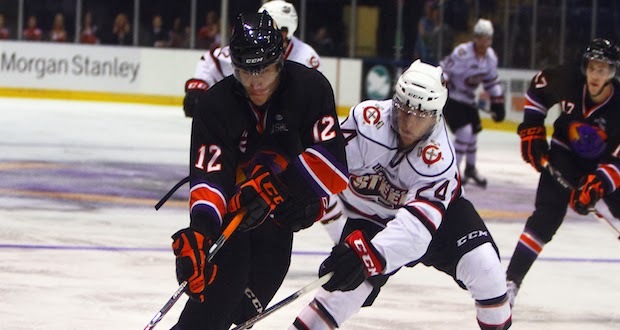 2014 recruit J.J. Piccinich (#12) scored twice for USHL/Youngstown, but the Phantoms dropped a 4-3 overtime decision to Chicago. A right wing from Paramus, N.J., Piccinich now has 12 goals in 22 games with half the scores coming on power plays. 2015 recruit Charles McAvoy assisted on both NTDP U17 goals, but Team USA fell to Dubuque, 6-2. The right-shot defenseman has two goals and three assists in his past six games. Nick Bonino scored a shootout goal, after recording his 13th assist in regulation, helping Anaheim to a 4-3 win against Chicago. We note with sadness the passing this week of pioneering sports agent and passionate friend and support of college hockey and USA Hockey Arthur Kaminsky. A Cornell graduate whose college roommate was Hall of Fame goalie Ken Dryden, Kaminsky represented hundreds of hockey players as well as 1980 U.S. Olympic coach Herb Brooks. He was a consultant to the movie "Miracle" in which he was a character. Kaminsky, just a few weeks shy of his 67th birthday, was at the Madison Square Garden last Saturday to watch Red Hot Hockey IV. #9 Terriers edged Minnesota-Duluth, 6-5, in a high-scoring game at Walter Brown Arena. Sophomore Sarah Lefort led the way with two goals and assist. Improving its record to 13-3-1, BU also received goals from captain Louis Warren,sophomore Rebecca Russo and freshmen Samantha Sutherland and Maddie Elia. The teams meet again on Saturday afternoon at 3 p.m.